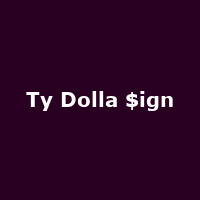 Ty Dollar $ign is American rapper Tyrone William Griffin from Los Angeles. He first came to prominence with an appearance on YG's 2010 single, "Toot It and Boot It". Following the release of that single, he released a number in his own name, many featuring other acts, as well as appearing on many songs by other acts. He released his debut album, "Free TC" in 2015.